I’d been dying to try out the mini bundt pan I’d gotten on clearance. I love the way the pan looks. Beautifully designed and very intricate. I don’t think this was the ideal recipe but a lovely tasting cake to share none-the-less. Unfortunately the appearance wasn’t as desired so I will try again with a smoother batter designed for bundt pans to see what results I get. 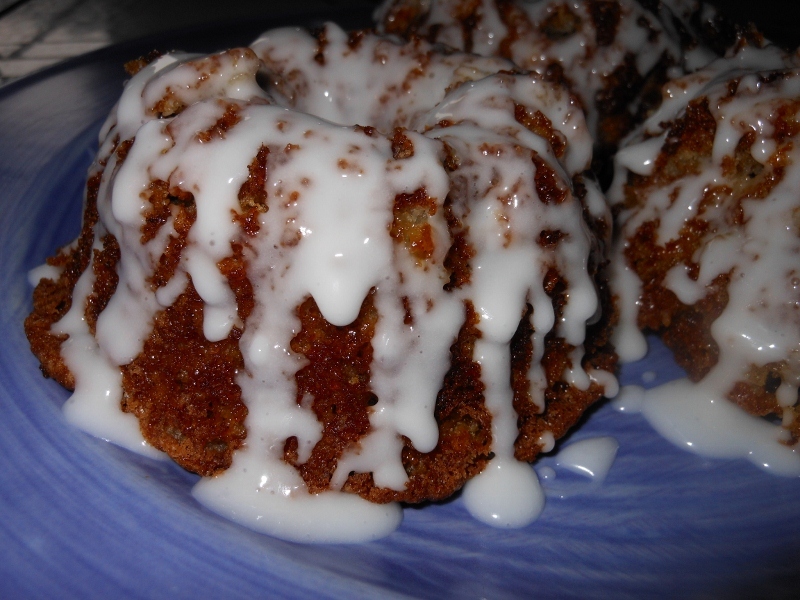 These would probably work great in cupcake pans with liners though so plan on making about 6 muffin size cakes; otherwise if you are feeling adventurous make about 3 mini bundt cakes. Cream together butter and sugar. Add eggs and vanilla. 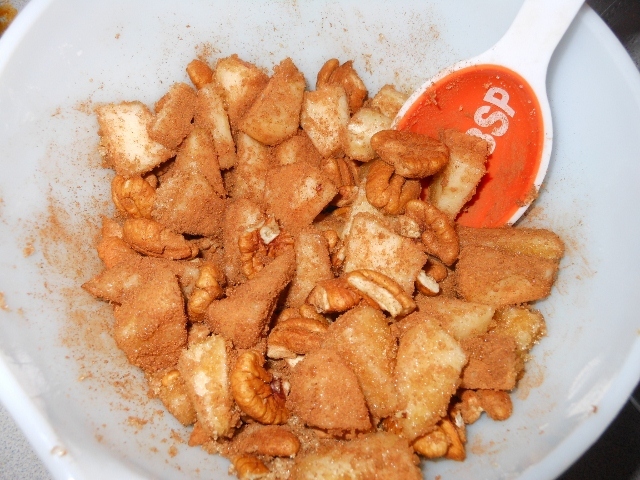 Stir in flour, baking soda, cinnamon, and nutmeg. Prepare apple and toss with lemon juice. Stir into batter and add pecans. 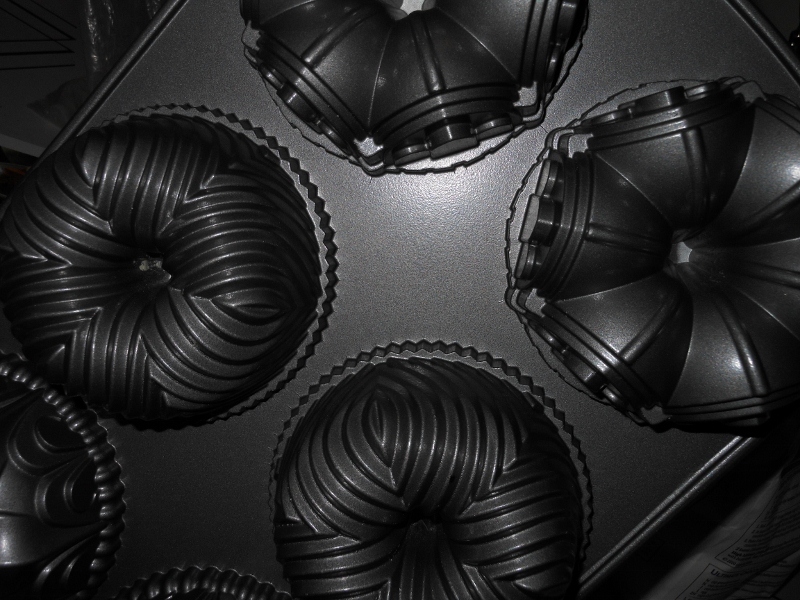 Divide into greased muffin pans (6), or mini bundt pans (3) filling about 2/3 full. 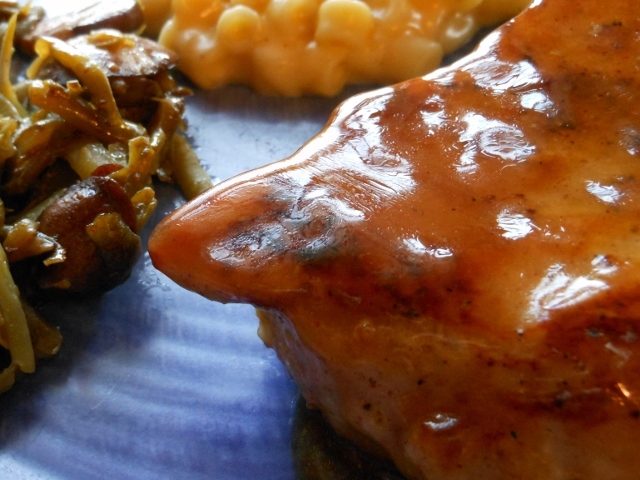 Bake at 350 degrees for about 20 – 25 minutes or until top springs back with lightly touched. Allow to rest in pans for about 5 minutes before removing. I had issues with sticking a bit but if you add some powdered sugar glaze you can hide anything! As far as the bundt pans go I was a bit disappointed that they lacked the definition shown in the pans, but the flavor was great. 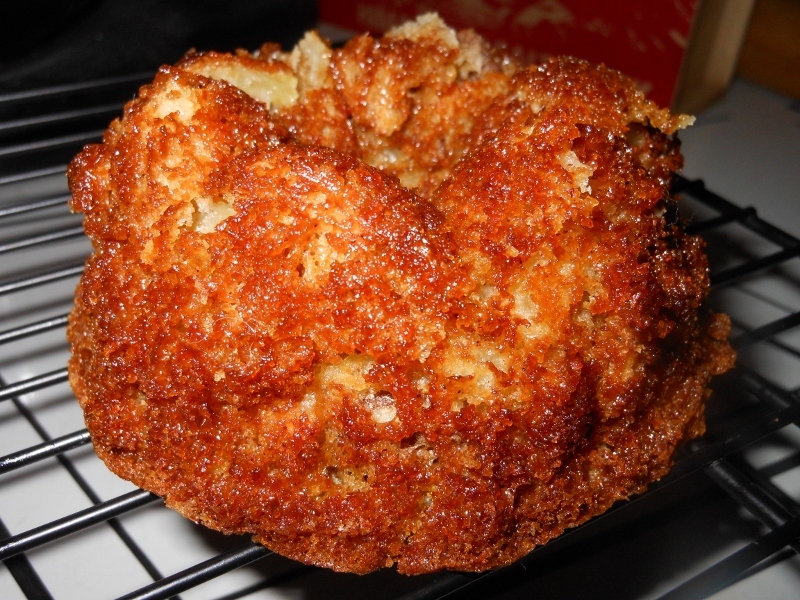 In fact I had some for breakfast and was thinking about scrapping the whole bundt pan idea and making a brown sugar crumb topping next time I give it a go. 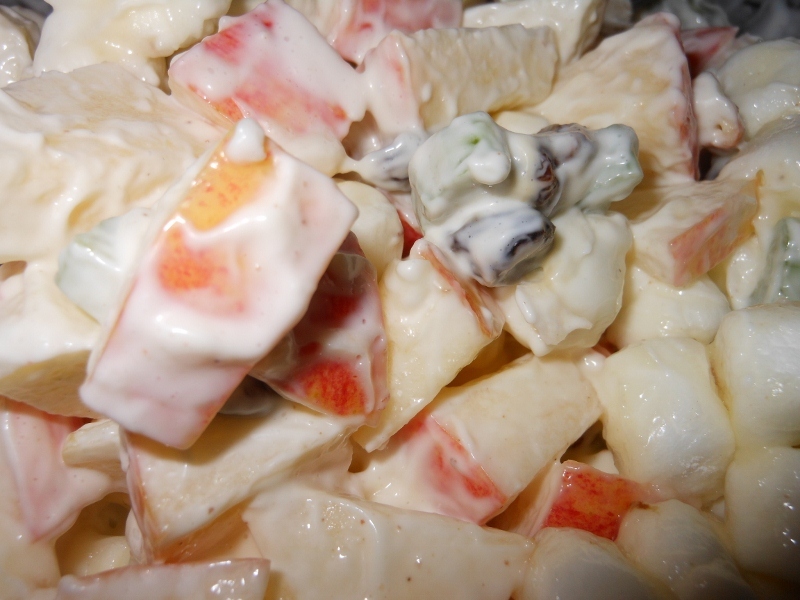 Apple salad is one of my favorites. I don’t eat nearly enough fruits so it is a good way to sneak in an extra bit of apple from time to time. 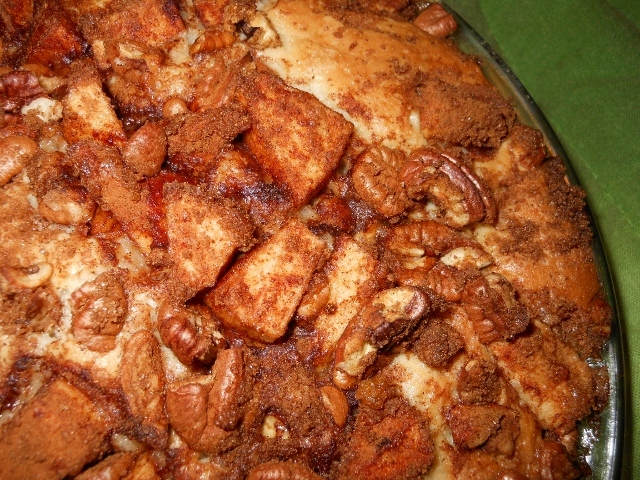 I enjoy mine with pecans and raisins; but sometimes I use walnuts or grapes instead. 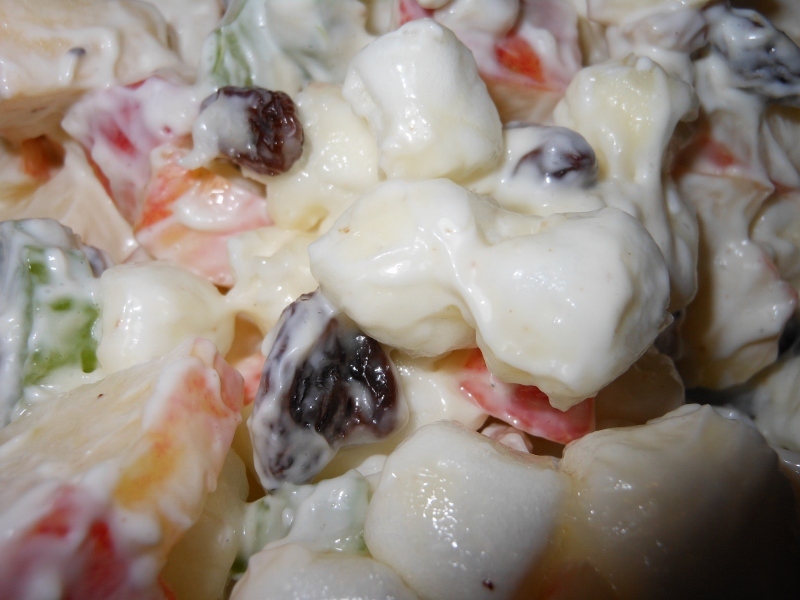 The mayonnaise and marshmallows marry perfectly to make a deliciously creamy dressing. Begin by pouring about a quart of water into a large bowl and adding the juice of 1 lemon. Chop celery, raisins and pecans and add to bowl of lemon water. 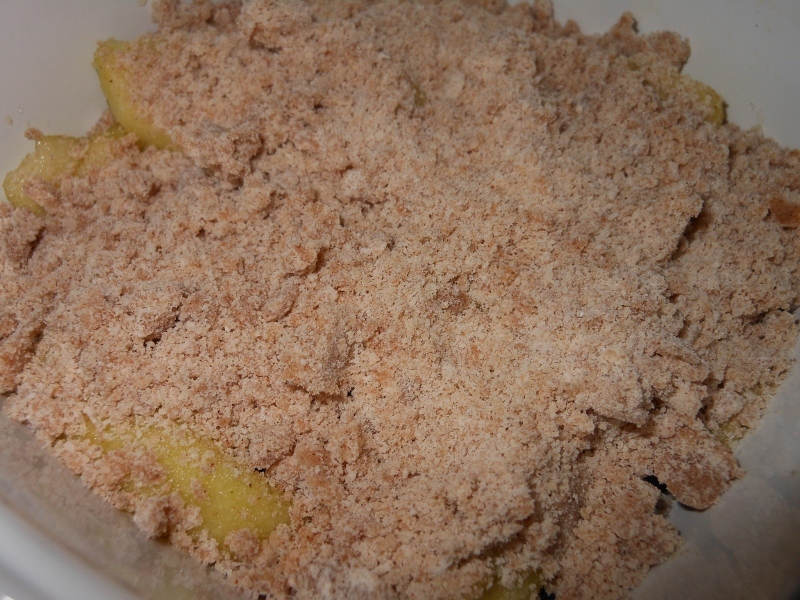 Cut apples into quarters and remove core; dice apple into bite size pieces and add to bowl as well (the lemon juice will help keep the apples from darkening). Allow to soak for a few minutes. Drain well and add marshmallows and mayo. Mix well; refrigerate for at least and hour before serving. Makes about 5 cups. 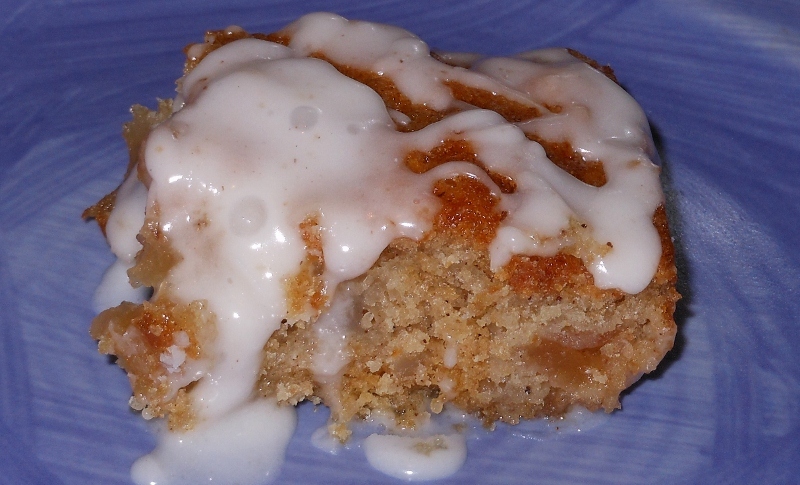 Apple Cinnamon Cake ~ a twist on zucchini bread and cobbler! 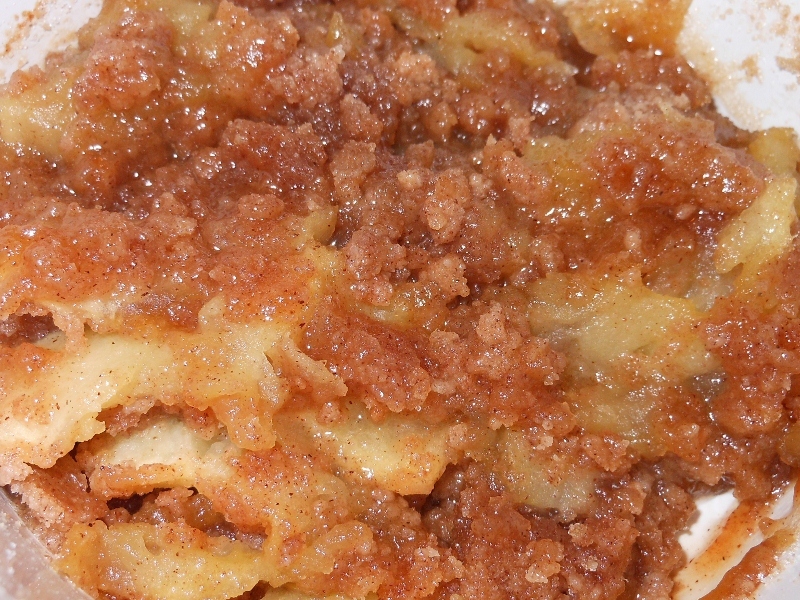 I get to work today and my cooks are trying to make something of this mushy apple cobbler they’ve been trying to use out. 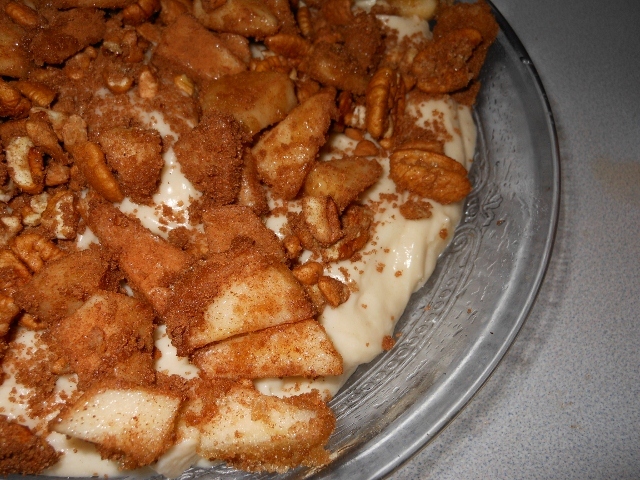 Trying to sell it as cobbler just isn’t working ~ looking at it leaves something to be desired. So I get to thinking; what can I do with this? So before 9:30 in the morning it comes to me ~ a cake! 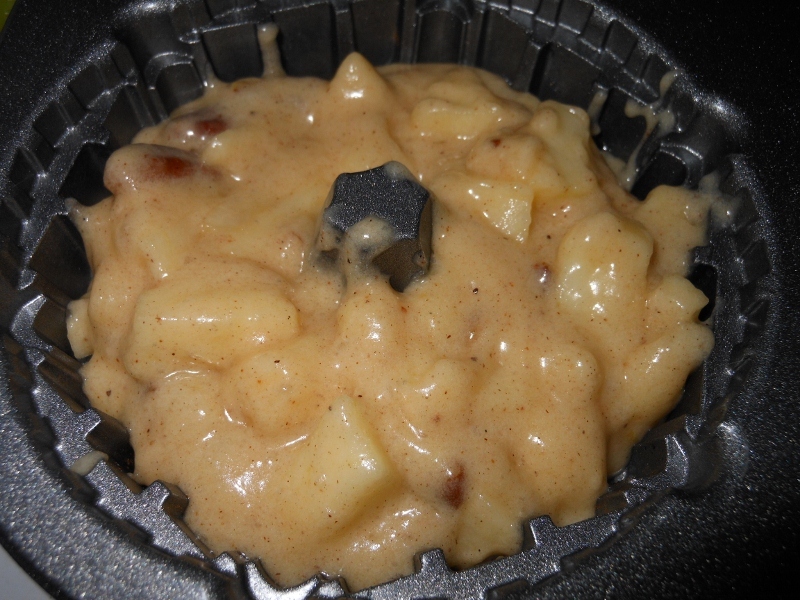 There is nothing wrong with it ~ it just looks like mushy canned pie filling and I’m not baking and slicing pies today so cake it is. Well, now I need a recipe. 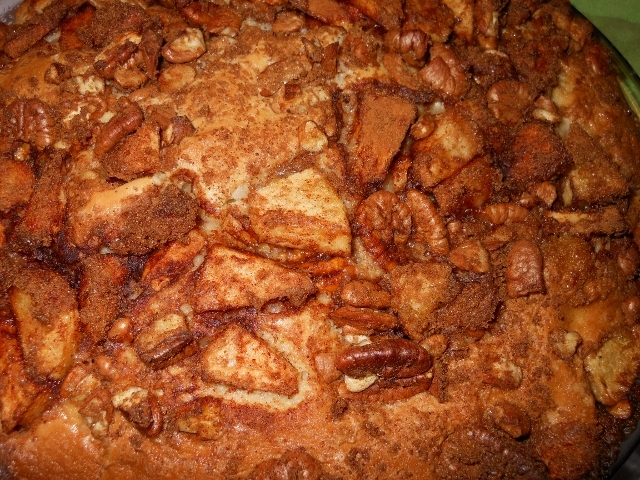 Flip through the books and find a bananna bread ~ maybe that will work ~ mushy banannas ~ mushy apple cobbler filling …. sounds like about the right consistancy to me …. ok, no shortning. I get to looking some more and come to a zucchini bread recipe … pehaps this will work. Indeed it did ~ not too sweet, dense like a quick bread but moist like a cake. This would have made a great bread too, but cake goes better on the buffet so cake it is! Combine first 6 ingredients. Mix together oil, eggs, and vanilla. Add to dry ingredients stir just until moistened. 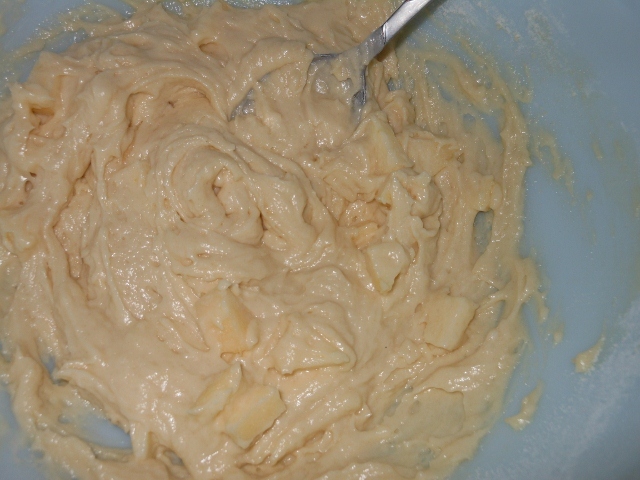 Add apple filling mixing until combined. Pour into 2 ~ 9 inch square pans and bake until toothpick in center comes out clean. 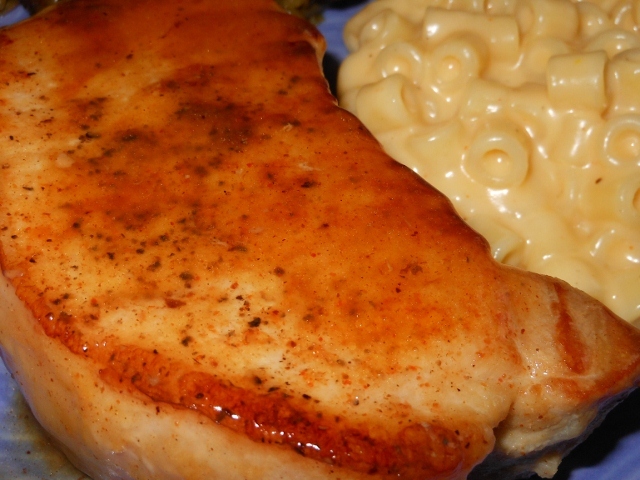 350 degrees for 35-45 minutes should do the trick. Once cool add some icing if desired. 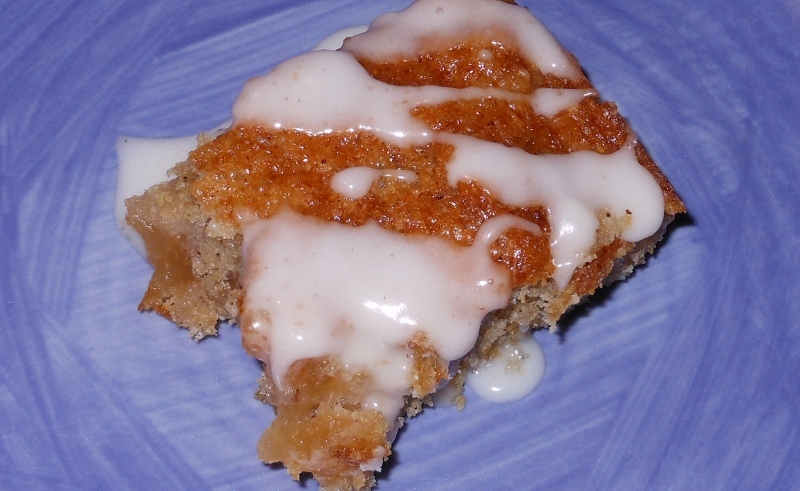 I used a simple powdered sugar and milk with a dash of cinnamon glaze. Use your favorite ~ I’m sure cream cheese icing would be yummy too.